COLORADO SPRINGS, CO (KTRK) -- Husband and father of four Brandon Sistrunk won't be home for the holidays this year, but that didn't stop his wife Ashley from making sure they posed for their family Christmas card together. Sistrunk has served in the Air Force for the last 10 years and has been deployed four times. He is currently in Iraq, but his wife, Ashley, and their children live in Colorado. However, she still wanted to include him in their Christmas card - so she went to Pinterest for ideas on how to make it happen. Ashley's mother took a photo of her and the kids, and a military friend of Brandon's took a picture of him. Ashley then stitched the two images together in Photoshop and shared it with friends on social media. This is not the first time Ashley has gotten creative to include her husband in their holiday celebrations. For Thanksgiving, she taped his photo to a chair while the family ate dinner. "They adore him," said Ashley. "He will do anything for them." Sistrunk is scheduled to return home to his family in 2017. 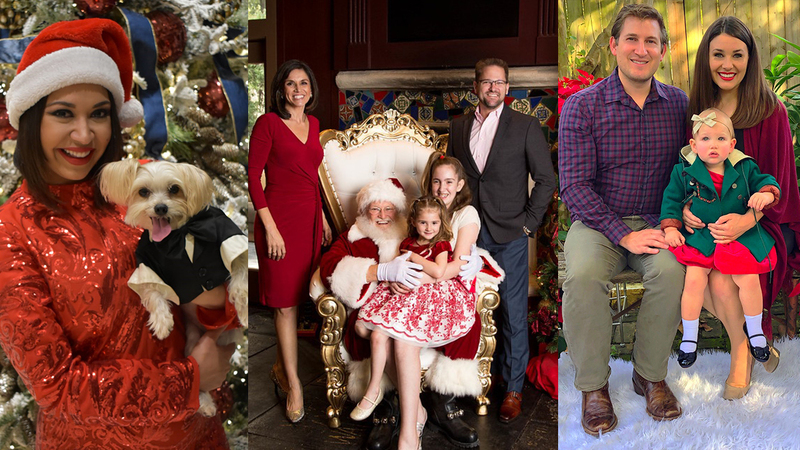 ABC13's anchors and reporters share their holiday cards. From our families to yours: Happy Holidays!